This recipe was submitted by Eric Nagel: My family has been enjoying eMeals for a few months now (my review of eMeals can be read here), and recently we had our first meal that called for wine. 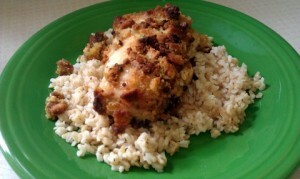 The kids loved the Swiss Chicken, but I thought the stuffing was rather dry (and burnt, in some areas). Next time we have this meal, I’d like to cover the dish with aluminum foil to see if the stuffing could remain moist. Also, my wife just grabbed a bottle of wine from the basement (it was a bottle from my recent shipment from Laithwaites wine club) – I wonder how a different white wine would change this dish? Melt the butter & combine with the stuffing mix. Combine wine & cream of chicken soup. In a casserole dish, cover chicken with a slice of cheese each. Pour over the wine & soup mixture, then the stuffing. Bake uncovered at 350° F. for 45 minutes. This entry was posted in Casseroles, Dinner, Poultry and tagged butter, chicken breasts, cream of chicken soup, eMeals, Eric Nagel, Laithwaites Wine Club, stuffing mix, swiss cheese, white wine by Trish. Bookmark the permalink.